Just a month into starting a new job at the National Park Foundation (NPF), I was fortunate to get to travel to Maine in early July to visit Acadia National Park for the first time. One of my first stops was in the beautiful bayside town of Bar Harbor, where I met with the Friends of Acadia staff. They provided great suggestions for lesser-known trails to hike, best places to kayak, and a wealth of other information that increased my enjoyment of the visit. 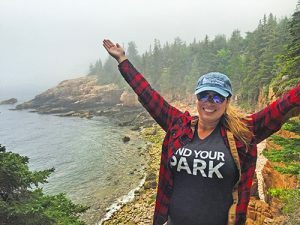 From hiking the pristine trails and mountains, to the stunning seaside landscape, to the vast wildlife and the peaceful campgrounds, Acadia National Park exceeded my expectations. I look forward to working with more park philanthropic partners like Friends of Acadia to protect, connect, and engage more visitors to our national parks. As the national nonprofit partner to the National Park Service (NPS), NPF values the philanthropic organizations working on behalf of individual park units throughout the country. Working with the Friends Alliance – of which Friends of Acadia is an active participant – and the broader community of park partners, we take great pride in being a part of the growing movement of support for our national parks. NPF helps to grow and support the continued success of groups like Friends of Acadia by offering a range of technical assistance options and helpful tools. For example, my Foundation Relations team at NPF works with park philanthropic partners to support the Every Kid in a Park initiative across the country. Every Kid in a Park has brought 390,000 fourth graders to national parks. Park philanthropic partners (often referred to as friends groups) are individual nonprofit organizations that support the success of a specific national park with time, expertise, and privately-raised funds. As champions of parks, these partners frequently engage area communities in the park and garner financial support and volunteer time in support of park priorities. Private sector support for America’s national parks is a tradition as old as the parks themselves. Even before the establishment of NPS, citizens were stepping forward to protect special places that exemplify America’s national heritage. providing depth for NPS staff, such as helping with volunteer recruitment, management, and training. As the new Foundation Relations Manager at NPF, I am so excited to support America’s national parks and programs by working with park partners to seek foundation grants to ensure the vitality of these natural and cultural treasures. I’m so lucky to get to visit amazing parks such as Acadia both for pleasure and now for my new job. I encourage you to get out there and #FindYourPark/#EncuentraTuParque too! Congratulations on your new job with NPF and thanks for the support of the Friends Alliance. I am looking forward to visiting Acadia next week and expect to find a deep chill along with a beautiful, winter wonderland. Be sure to stop by the San Juan National Historic Site the next time you are in the Caribbean…by the way, Winter is always a good time to visit.